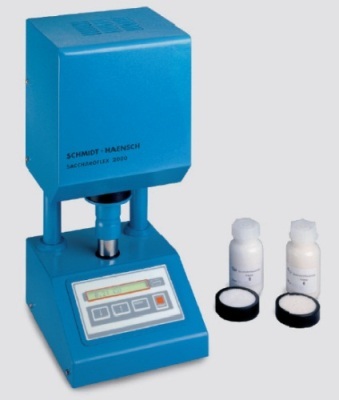 The SCHMIDT+HAENSCH electronic reflectance-meter for the automatic color grading of crystalline sugar according to the recommendations of ICUMSA, method GS2-11 (1994) and GS2-13 (1994). With this instrument the reflectance factors at 495 nm and 620 nm are measured and the ratio is indicated in terms of color type numbers. The measurement is done by use of Taylor's law and an integrated sphere. To decrease measurement instabilities caused by inhomogeneity of the sample (e.g. different grain size)a great sample surface was chosen. Only two standards of the Brunswick color type or ceramic standards, preferably 0 and 6 are necessary to calibrate the Saccharoflex 2000. An adjustment can be carried over the keyboard. The Saccharoflex 2000 allows measurements up to 19.99 indicating units without further adjustments. LCD display with 4-button keyboard makes handling easy and standard serial interface RS 232 ensures proper printing. The adjustable working voltage provides a high service life of the lighting unit and by this, large replacement intervals. In addition the electric bulb is run by a power saving switcher which prevents the Saccharoflex 2000 from heating up, so that a continuous operation is possible without any problems. The consistent use of high integrated circuits, the little heating and the easy detachable lighting unit ensure that the Saccharoflex 2000 is a reliable and easy maintainable measurement system which corresponds to the high SCHMIDT+HAENSCH quality standard.